I made this cake for Bella’s birthday. It was a hit with all the chocolate lovers. It is dense and moist. Bella enjoyed her cake with a side of coconut milk ice cream. Preheat oven to 350° F. Grease an 8X8 inch baking pan. Stir in chocolate chips and pour batter into pan. Let cool and ice with your favorite chocolate icing. 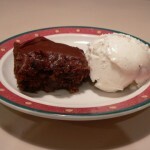 You may also enjoy Hot Fudge Cake swimming in chocolate sauce and Two Ingredient Pumpkin Bread with Apple Cider Glaze. « Gratituesday: Happy Birthday Bella! This looks yummy! I love chocolate and am so impressed that this is so healthy. Thanks for sharing with So Sweet Sundays! Happy Easter! Ah, yes. I am a chocolate addict! Thanks for hosting So Sweet Sundays! It sounds like she and I would get along well! I hope you both enjoy it. Do you think this recipe would double in a 9×13 pan well? I don’t know if allergy-free cakes work differently than “normal” cakes in that regard. Mary Jo, I think it would double just fine. If you try it please let me know how it turns out! Would using soy flour work instead of oat? I myself am allergic to oats and I’m not sure if my son is and do not wish to find out on his birthday. I have been looking for the wheat, egg and dairy free recipes for a few days now for a cake and this is the best one I’ve found so far! Hi Jes, Sorry I am so slow to respond; I took the holiday week off. I honestly have never baked with soy flour, but I don’t see why it wouldn’t work. Let me know how it turns out. Can I use sorghum or millet flour since I can’t eat oats? I’m sure it would be fine. Maybe not as moist though. Do you think you would be able to substitute the oat flour for coconut flour?